When the plane touched down, the world's most wanted narco looked confused. Overwhemd, even. Asking the Dea agent where am I? New York, they told him. 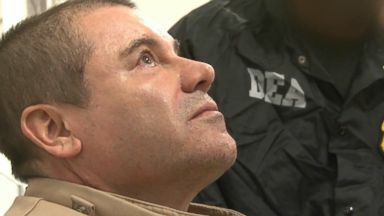 The most powerful drug lord reduced to tears. Now Joaquin archivaldo Guzman Loera looking at jell H jail. We expect it will bring a sentence of life without the possibility of parole. It is a sentence from which there is no escape and no return. He managed to elude capture for years, even escaping prison twice. Guzman made billions powerling poison over our boardser. Mistresses smuggled and drugs in bananas. With one witness testifying, a $100 million bribe was made to former Mexican president. The tale of El Chapo came crashing down an army, chief among them of D.E.A. Ray Donovan has been hunting el Chapo for the better part of two deck az. He controlled his empire. He didn't trust anyone. What message does it send to other drug taskers? It says clearly, if we can get our hands on El Chapo, I'd say we can get anybody. It involved 22 agencies and expand two countries. He's probably one of the most vicious, bad guys the world has ever seen. He planned his begs models on cops not talking to cops. We got better and better at it. The final raid leading to his capture and extradition, a gun battle. 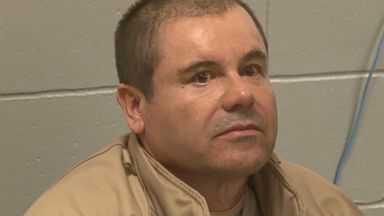 El Chapo nearly slipping away through the sewer before being apprehended by Mexican authorities. How did the extradition play out? We were concerned. Hey, if he already escaped from this prison, there's an opportunity for him to do it again. The Mexican government they had to get him out of Mexico. He ran the world's largest drug smuggling ring. His trial was marked by unprecedented security for jurors. Many of whom were scared for their lives. Think prior to the child el chap trial, his name was known muss with a ruthless killer, manipulator, violent drug trafficker, mountain launderer, liar and adulterer. He was the one who decided to add fentanyl to heroin to make it stronger. He didn't care about the consequences. He didn't care about lives being lost. An expert manipulator who had infiltrated the police. He believed strongly in a business model and that business model included corrupting virtually every corner of the Mexican government. His influence was so complete one testified he even underwent a number of plastic surgeries to fool authorities on his trail. If you wanted to work for sinaloa, you had to say where you live, where your parents are, where your children are so that if you got caught so you wouldn't captain. The smuggling operation bought $5 million worth of cocaine inside cans of jalapenos every year. Then the weeping mistress claimed they fled naked from U.S. Police enforcement. She dutyfully sat in court every day of the trial. His multi-national drug empire went into every major American city. From New York to Chicago. The Chicago crime commission designatesed him as public enemy number one. He was a genius. He had people working for him that didn't know they were working for him. A hundred thousand street galaxy in Chicago put his goods on the street. Drugs hidden on Boes and in cars. Perhaps most notesly, in tunnels. His nickname was rapido. Meaning fast. He was able to turn around drugs in the streets of the U.S. We got access to some of el Chapo's tunnels back in 2016. Probably whoever built this tunnel, probably not their first try. They had some experience. From above ground, just an average looking home. At one points authorities belief there were 200 functioning tunnels between the U.S. And Mexico. Something that remains clear, a wall is no match for the sinaloa cartel. It's still the number one cartel in the U.S. With the most drug markets. His sons have taken over, following in their father's footsteps. Until the owned he maintained his innocence. The defense claimed he was the victim of an lab rat conspiracy. Now 61, he's run out of escapes. He ex changed a thumbs up with his wife beforegg being escorted out of the courtroom. Hundreds of people being killed, innocent citizens who wrong time. El Chapo was responsible for this. Our thank to Matt Gutman.